Semibreve strikes a balance between a love of music and an understanding of local rhythms and context. Venues are all within walking distance and a programme that avoids over-saturation make it easy to find time to explore Braga, enjoy a few slower meals, and meet other festivalgoers or artists without constantly racing against the clock. Programmes are kept short and focused to encourage attentive listening, and new artistic pairings – often audiovisual – encourage experimentation. The installations at Semibreve provide a platform for emerging Portuguese audiovisual creators, and are a welcome way to catch some air and engage in new discussions during the later-night club acts. Communal meals are hosted daily for artists and invited guests, and the presence of artists, curators, and producers from other Portuguese cities hints at the vital role this type of festival plays in supporting creativity in a country that is still recovering from a long period of economic hardship. Notably, the links and community-building efforts extend into Spain, slowly reversing the historic isolation between the two neighbouring countries. Caterina Barbieri’s synth arpeggios evoke an 80s retro-futurist aesthetic that will resonate with the dedicated music lover as well as anyone who might have walked in off the street – which is fitting, because this is one of the shows offered free to anyone who lives nearby. Her work explores the power of repetition to open up the imagination and she is an engaging on-stage presence, silently singing along to some of the more dramatic moments or interacting with her synths in exaggerated gestures. We are in a medieval hall with thick stone walls, a wooden ceiling painted with ornate motifs, massive wooden chandeliers and very low lighting – a small table lamp by the synths and some gentle red illumination on the ceiling. The mystic atmosphere gets more intense with the setting of the sun as the natural change of lighting unexpectedly becomes an important feature of the performance, amplifying the music’s celestial quality. Fragility is a state that is hard enough to achieve in a recorded album, and arguably even more difficult to attain in a live concert setting. Fragility is not what comes to mind when you walk into the majestic Teatro Círculo. The vastness of Sarah Davachi’s music instantly filled the concert hall, pulling the audience into a state of careful listening. Her shifts in tone and timbre happen so slowly that they’re almost imperceptible, and her harmonies often verge on uncomfortable dissonance. The constant sonic stream demands a lot from the listener, and softly holds you in suspended animation until the music fades and deposits you softly back into your seat. Davachi’s performance creates a perfect point of entry into the fragile world of Grouper who, in a contrasting approach, creates hyper-attentiveness through restrained use of silence, negative space and remote breathy echoes. Preserving sounds until they completely fade away, invoking the loneliness of watching something from far away, her minimal performance flips us onto ourselves so we become our own focal point. The black box of a club setting offers a blank slate for possibilities – or a challenge for what a performer and a crowd can create together. 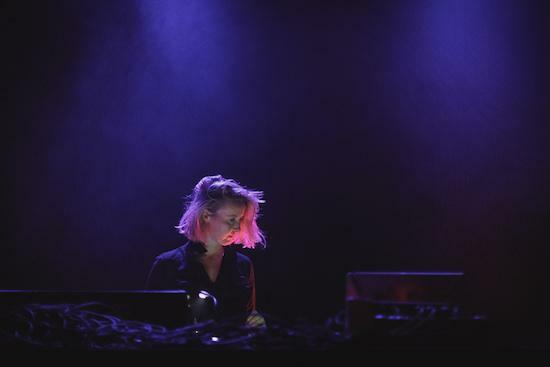 It was in such a room that SØS Gunver Ryberg launched into her opening set, no holds-barred, perhaps hoping to fast-forward into a peak-hours feeling. Her straight-up annihilation techno could easily come off as overkill for an opener, but it’s a good strategy - in a room that lacks atmosphere and with a tight curfew (the club nights don’t run late) - and it works. Ryberg’s infectious and generous on-stage presence, dancing and acknowledging each whistle or cheer thrown her way, is crucial in sweeping us up into her spirited timewarp. Later, with a core set of dancers warmed up, Stingray launches into one of his unassuming and brilliant signature vinyl-only sets that alway remind us how timeless classic Detroit techno is. The pleasure of watching two expert improvisers collaborate is boundless. Keith Fullerton Whitman and Pierce Warnecke have been brought together specifically by and for Semibreve and their improvised sessions, performed in two vignettes, radiate the raw and playful power of pure experimentation. Warnecke’s abstract imagery explores synthesis, deterioration and disappearance, evoking the same search for compositional possibilities inherent in Whitman’s idiosyncratic sounds. Few artists have such a unique take on laser technology as Robin Fox. 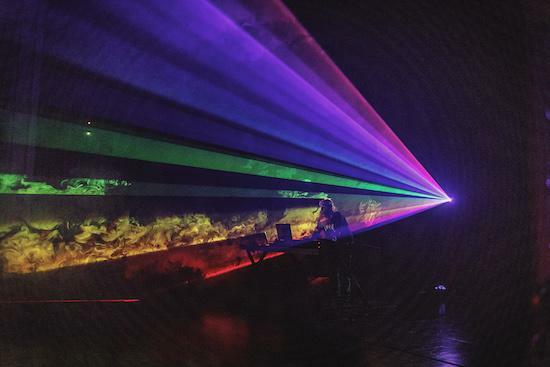 Projecting his beams towards the audience rather than onto a screen behind him, Fox pairs light with audio to create a fully synaesthetic experience that proposes different ways to imagine the structure of sound. He is playful, oscillating from rapidfire hyperactive beams and trippy swirls to slow planar sweeps where beautiful patterns emerge within the smoke-filled room. Clear tones, gurgling sonic sparks and the roar of motors reflect the changing colour, texture, velocity, grain and breadth of the lightforms. What better way to exit a festival than through a funky wormhole?